Traveling with a Newfoundland dog in Newfoundland must be a bit like traveling in the US with your pet Eagle. You know how we Americans are about eagles. It doesn't matter how many times you have seen one, they always fill us with awe. When an eagle sits in a tree to survey its domain, the first spotter cries an alarm, then everything stops while people turn to watch. Carry that eagle around on your shoulder into a room and just imagine the response. Much the same happens in Newfoundland when you show up with your Newfoundland dog by your side. Young and old alike gravitate to her. There is a reverence that you don't get from people when you walk around with your Newfy any other place. Children rush over, yet stand a few feet away, eyes bright and shinning with big smiles across their faces. Two young girls of about 10 and 12 approached us at a visitor's center. After admiring Arayo for a time, they asked if they could please touch her and shared that they have lived their ENTIRE LIVES on Newfoundland and never seen a Newfoundland dog before! A handsome white haired gentleman of about 70 or 80 departed a small tour boat. He had been born and raised in Newfoundland and had brought his wife and grown children back to the island for a visit. He reached out with excitement as he exclaimed "A Newfoundland Dog! We have been looking for two weeks for one!" Recognizing a true sucker, Arayo hopped up to kiss his face as I apologized for her being fresh and over exuberant. He laughed like a school boy, got down on his knees, tussled her fur and asked his kids to take his photo with her. At the Viking village, Arayo drew attention away from the historical ruins and a tour bus of Senior Citizens took turns having their photos taken with this living symbol of the island. When asked where she was from, I shared we'd been on the road for over 6 weeks and had traveled from the Seattle area, "though she is originally a California Girl," I'd explain. 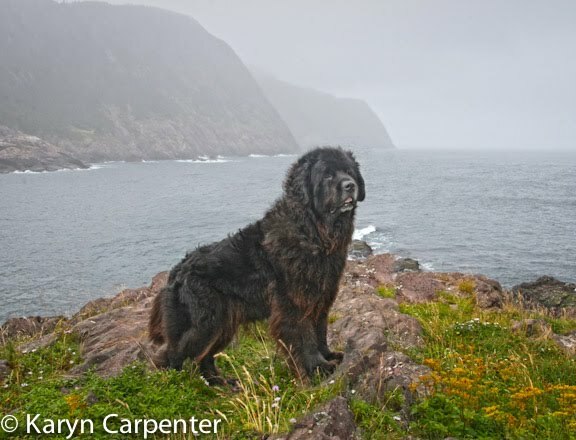 "Doesn't every Newfoundland Dog need to make the journey back to visit her roots?" State and National parks are scattered along the island's shores and tourists make the stops at many or all of them. Everyone wants a photo with the Newfoundland Dog but my photographer's eye disapproves of their choice of background or their camera angle. In the back of my mind, I think I should take Arayo to a location, select my background and wait. Charge $1 to use their cameras and take people's photos with the Newfoundland in Newfoundland. I'd pay for this trip in no time! HA! That southwest coast is still pulling at my heart! A traveler at heart but with an entrepreneur's soul. Somehow I don't think I'd get the same response if I took the Saints back to their roots. I know they'd be loved and accepted and spoiled, but I think they are more common in their homeland.